Brits across the nation have been hit with 65mph gales on Sunday morning, causing travel mayhem in parts of the country. 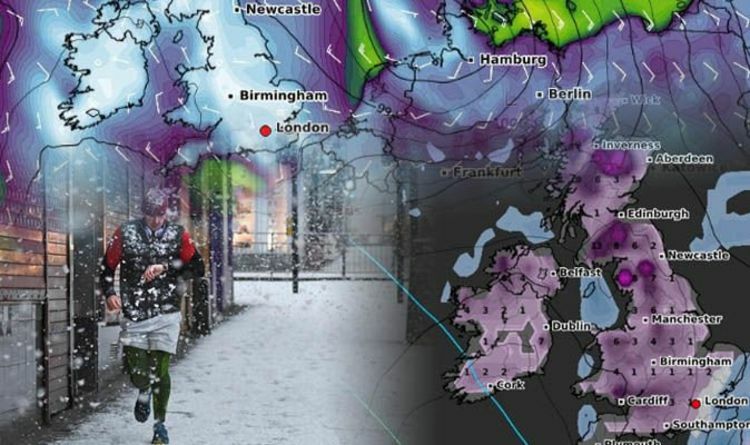 A Met Office weather warning for wind, snow and ice is now threatening to bring even more chaos. The warnings are in place for parts of England, Wales and Northern Ireland. The Met Office warned transport will "likely be affected by snow" and that blizzards are a possibility on "higher ground". The weather service added: "Icy surfaces on roads and pavements could lead to an increased likelihood of accidents and injuries. "Rain across northern Scotland on Saturday evening will turn increasingly to snow, at first over hills and then down to lower levels. The strong gales have led to dozens of power cuts in areas from southwestern England to the Midlands. A warning has also gone out to drivers as winds of more than 65mph caused travel disruption across Cornwall on Sunday morning. Snow could also affect certain routes as the day goes by, especially in higher areas. Trees are down from the A39 at Camelford to Carnon Downs near Truro and Crowlas near Penzance. Sailings of the St Mawes Ferry have been cancelled too, as strong gusts sweep across the Duchy. Devon and Cornwall Police said officers are busy responding to reports of downed trees and power lines. Met Office meteorologist Becky Mitchell said: “After a fairly cloudy, wet and reasonably mild day for most of us it is all set to change on Sunday. “Colder air from the north will sweep across the country bringing a risk of ice and for some of us some snow. The Met Office expert also predicted a “widespread frost” for Monday morning as temperatures are forecast to plunge even further. The weather forecast has forced bookies to slash the odds on this month being the coldest January on record into just 1/2 as Britain is set for a big freeze next week. Bookmaker Coral also offers 1/6 there will be snow in any major city in the UK next week.